Among other things, today is National Hot Chocolate Day. Persons born on September 27 who've said notable things include William Empson, Clementine Paddleford, Samuel J. Ervin, Myrtle Reed, Henri Frédéric Amiel, Samuel Adams. VIDEO: Florida man kills lionfish with Glock handgun. With a gun modified to include a longer barrel and lead-free ammunition that's non-toxic. Except to the lionfish. Autotune, the pitch correction software, was invented by an oil engineer who used linear estimation theory and signal processing to pinpoint oil drilling locations with seismac data. You're more like to be killed by deer than by sharks, bears, and alligators combined. There's a 1 in 1.4 million chance that when you check out of this life, an animal will have punched your ticket. In the U.S., the deadliest animal is the deer, who kills you by being too stupid to learn about motor vehicles. Disney may buy Twitter. Have we not suffered enough? 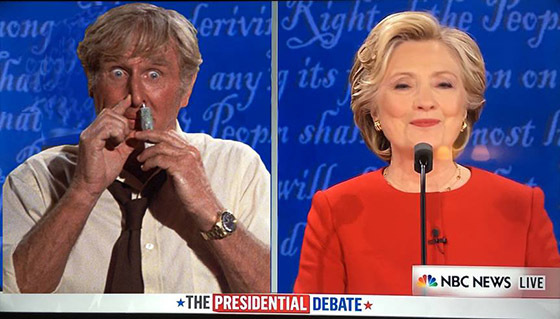 The debate went more or less along the line that was expected. All the Trump supporters are staying with Trump, and Clinton followers aren't budging, either. Trump's nervous tics and compulsive water drinking reminded me of an elementary school kid trying to hold it together while the effect of the Adderall wanes. 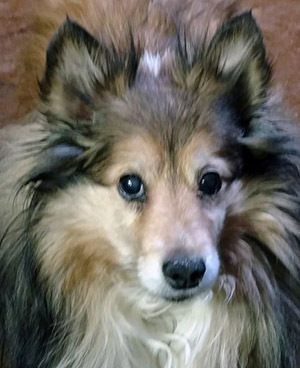 Cindy felt the lump on Sunday while grooming Riley, our 12½ year old Shetland Sheepdog. We got him to the vet first thing Monday morning. There were some iffy looking things in the needle aspirate, so we're waiting for blood test results. If they're ok, Riley will have surgery later this week to remove the tumor. We're hoping the thing comes off clean and hasn't metastasized. Odds are we could get another good year or so with him in relatively good health. We've been through this before, and the numbers are unpleasant. 25% of all dogs develop cancer at some point in their lives, and 50% of all dogs over the age of ten actually die from it. The average lifespan for a Shetland Sheepdog is 12-13 years. We had one go before he was ten, and another almost make it to 15. Riley will be 13 in February. I think he'll make it. He's a tough little guy. He was the runt of the litter and rejected by his mother when he was born on a cold February morning in 2004. My wife hand-fed the three-inch long wisp of fur every two hours for two weeks, until Lucy, another of my wife's dogs, had her litter and accepted Riley as her own. It ain't over 'til it's over. The biggest problem is going to be trying to figure out ways to spoil him at a level more outrageous than the current one.